Here's something for all you beachcombers this Fourth of July. 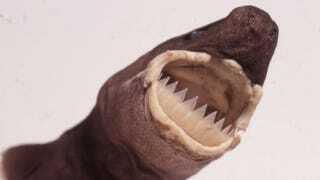 Researchers have documented the first-ever case of a cookiecutter shark attacking a human. Although this shark maxes out at ~22 inches, its scoop-like bite is the stuff of nightmares. The cookiecutter shark (a.k.a. the cigar shark) may not be the most dangerous shark out there, but its modus is gnarly. The cookiecutter shark spends the day two miles below the surface and ascends at night to hunt. Its attacks are hit-and-run — the cookiecutter quickly twists out circular lumps of flesh from its much-larger prey before jetting off. Its bloody brand has been found on seals, tuna, whales, and other sharks. The victim was an accomplished long-distance swimmer attempting to cross the Alenuihaha Channel on a straight-line track from ‘Upolu Point on the island of Hawai‘i to Kaupo, Maui [...] The total distance was 47.5 km, and crossing time was expected to take 16-20 hrs. Inspection of the wounds in the emergency room showed a superficial C-shaped wound on the mid/lower sternum [...] and a circular open wound of the posterior lower left leg [...] The leg wound was located at the junction of the middle and lower third of the calf. It represented a near circle and measured approximately 10 cm in diameter and 4 cm in depth. Here's what Spalding's leg injury looked like (warning — not for the squeamish). Here's also a BBC clip of the cookiecutter taking a chunk out of a tuna. The cookiecutter is found around islands all over the globe, but you won't be courting the cookiecutter's rare kiss unless you're indulging in some night swimming. I wish they made a Jaws sequel about a massive school of these little bastards. If I had my filmmaking druthers, I'd schedule Cookiecutters for the winter holiday to attract the lucrative "parents-who-didn't-do-their-research" demographic.